Young brothers Duncan and Hayden wanted to recreate the archery scenes they loved from the movie "Brave." 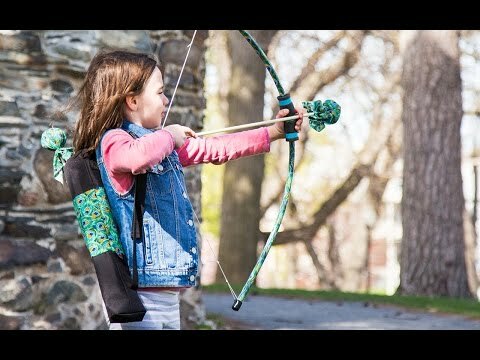 With some help from their mom, they designed their own kids’ archery sets. After developing their first bow and arrow prototypes, Two Bros Bows made a small batch to sell locally. It quickly sold out and the two young entrepreneurs decided to grow their business. 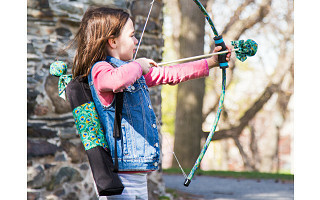 Their Made in the USA sets are now ready to get kids everywhere interested in archery, and parents will appreciate that this pastime develops hand-eye coordination while playing outdoors. The arrows and bows are hand-assembled and have rustic, unfinished quality. It honors their roots as a kid-made creation, and is definitely part of the appeal. The stuffed, soft-tipped arrow is gentle for little archers, so they can’t poke themselves—or each other—but can still shoot up to 30 feet. Kids can take aim at targets or stage imaginary battles with this charming set made by two brothers just like them. Hello everyone! My name is Elisha and I am the CEO/Mom of Two Bros Bows, LLC. Kid friendly bow and arrow invented by my two sons Duncan and Hayden. We are so thrilled to be sharing our story and handmade products that are Made in the USA to you on The Grommet. Would love to answer any questions that you may have. When your kids came to you with this idea, did you think it could be a business? Either way, how did you go about turning it into one? @Mike We didn't think it would become as big as it has. It just started to catch on so quickly that by the third outdoor show we did we got our first store account! We are now into our third year and have sold to over 800 + stores nationwide. @Erica Ha! They are third party tested for ages 6 and up. We find that most kids from ages 6-12 love the product! For target practice you could add Velcro or some sticky substance to the target & the tip of the arrows. @Mary Yes! Very good question. The boys have already researched that and have explored. Due to the length of the arrow and weight of the kid friendly foam tip, it does not work. We do keep thinking of new inventive ways. One of our favorite target games is the simple use of water bottles as target practice. Fill each water bottle with different levels of water amounts to make it more challenging. Aim and shoot to see if you can knock it down. Have these been tested for safety? Do the kids have to wear goggles? Is there any chance that the soft tip can fall off? @Howard Yes Howard, we have had our products third party tested. The foam tip can come off with 50 pounds of pressure but third party testing required 18. As far as goggles go, we have never heard of anyone needing them due to foam tip being larger than your eye socket. How long it it until they remove the foam point? Then it could hurt eyes. All the more reason to keep the foam point on, Nick! Well, yeah! Ever see kids at play? I have. Believe it or not, I actually was one. Removing the tips takes away most of the fun and would actually be difficult with the zip tie keeping them secure. Young brothers Duncan and Hayden wanted to recreate the archery scenes they loved from the movie "Brave." 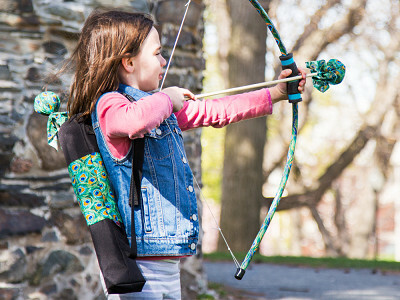 With some help from their mom, they designed their own kids’ archery sets. After developing their first bow and arrow prototypes, Two Bros Bows made a small batch to sell locally. 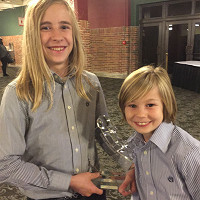 It quickly sold out and the two young entrepreneurs decided to grow their business. 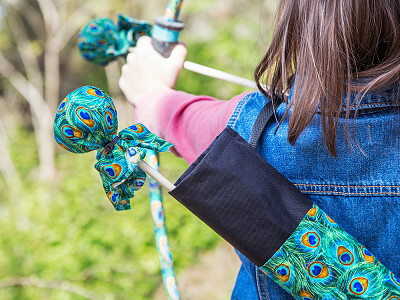 Their Made in the USA sets are now ready to get kids everywhere interested in archery, and parents will appreciate that this pastime develops hand-eye coordination while playing outdoors. The arrows and bows are hand-assembled and have rustic, unfinished quality. It honors their roots as a kid-made creation, and is definitely part of the appeal. The stuffed, soft-tipped arrow is gentle for little archers, so they can’t poke themselves—or each other—but can still shoot up to 30 feet.